Home | Blog | It’s hip to be SQUARE! Hi friends! Happy Monday! I’m excited to welcome back co-owner of Newton’s Nook and Mama to Newton the cat, Jen Jackson as our special guest! She has made two vibrant and beautiful cards to share! Read on and enjoy! Hello! 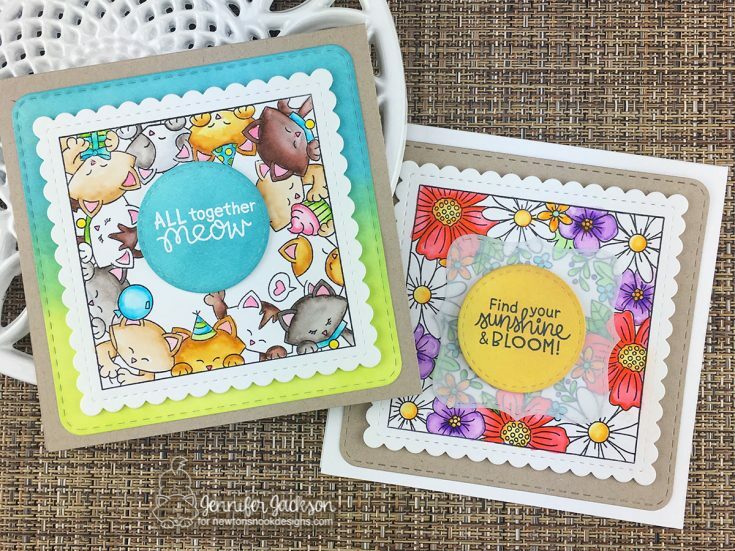 This is Jen from Newton’s Nook Designs and I’m super excited to share some cute square cards with you today! 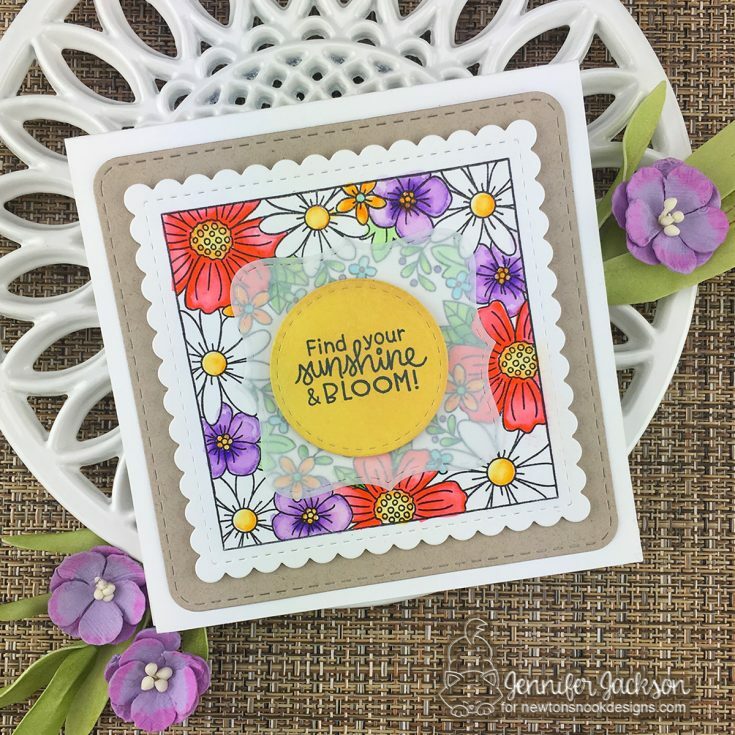 I’m featuring our two new square designs, Newton’s Block Party Stamp Set and Floral Fringe Stamp Set. Both of these new sets also work perfectly with the new Frames Squared Die Set. I am having so much fun with these new products! For my first card I created a kitty birthday card using the Newton’s Block Party Stamp Set. This set is so purr-fect for cat themed birthday cards! 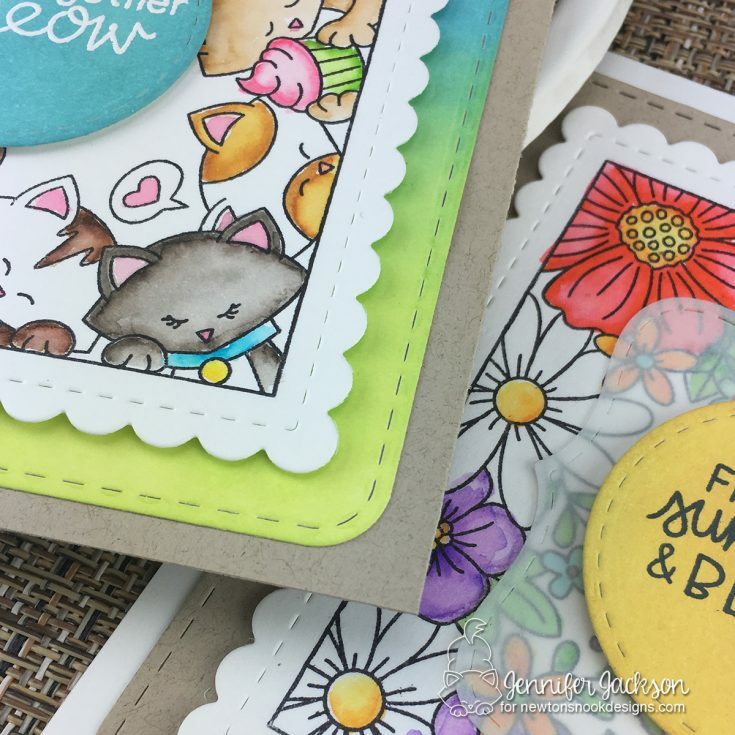 It has kitties all around the edge that are SO fun to color and a bunch of fun birthday and kitty themed sentiments that fit in the middle of the big image! I knew I wanted to use watercolor markers so I stamped the image onto Strathmore Bristol paper using Archival Jet Black Ink which is my go-to waterproof ink. I colored in the image using Zig Clean Color Real Brush Markers. I usually color around the edge with the color I’d like to use and then pull the color into the center using a Tim Holtz watercolor brush filled with water. I colored the kitties neutral browns and grays and then added pops of teal, lime green, yellow and pink for their accessories. I cut the image out using the die from the new Frames Squared Die Set that has a scalloped edge and stitching too. Then I cute a piece of Neenah Solar White Card Stock using the rounded edge square with stitching from the Frames Squared Die Set. I used Twisted Citron and Broken China Distress Oxide Inks with a mini ink blending tool to create the ink blend on this piece. I also cut a the stitched circle from the Frames Squared Die Set out of Neenah Solar White Card Stock. Again, I added blue ink to it using the Broken China Distress Oxide Ink and mini ink blending tool. 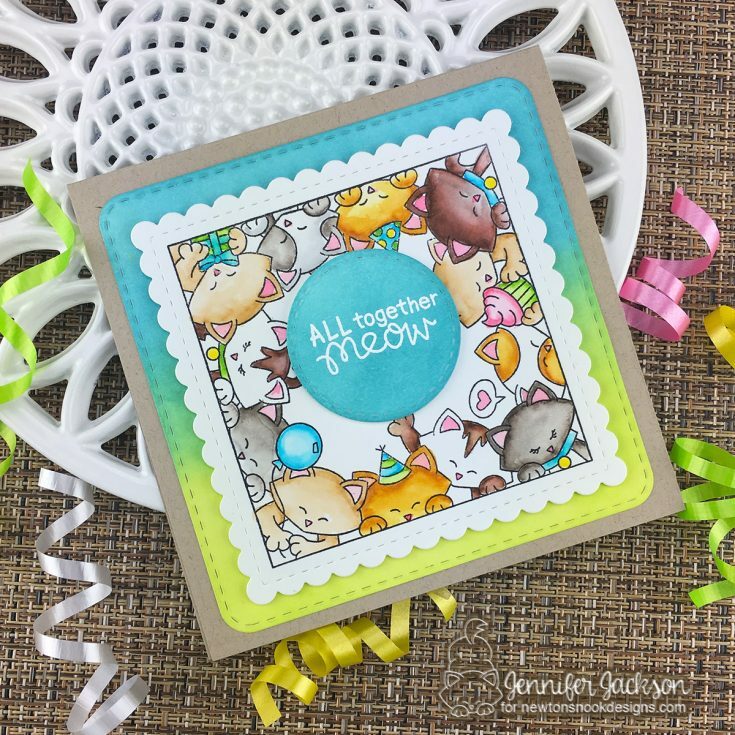 I stamped the sentiment “all together meow” from the Newton’s Block Party Stamp Set. Everything was adhered together using a Kokuyo Tape Runner and some 3M Foam Adhesive to add dimension to the layers. Then I mounted it onto a 5″ square card base that was cut and scored using Neenah Desert Storm Cardstock. For my second card I created the card in nearly the same way but this time it has a fun floral theme. I used the image of flowers around the edge from the Floral Fringe Stamp Set, stamping it onto Strathmore Bristol paper using Archival Jet Black Ink. I also colored these pretty flowers with the Zig Clean Color Real Brush Markers. I just love how bright and pretty these watercolors are! I cut the image out using the scallop edged square die from the new Frames Squared Die Set. Then I used the small decorative square from the Frames Squared Die Set and cut it out of vellum. For the center, I cut the stitched circle from the Frames Squared Die Set out of Neenah Solar White Card Stock and made it yellow using Fossilized Amber Distress Oxide Ink with a mini ink blending tool. Once it was dry I stamped the “Find your sunshine & bloom” sentiment from the Floral Fringe Stamp Set. 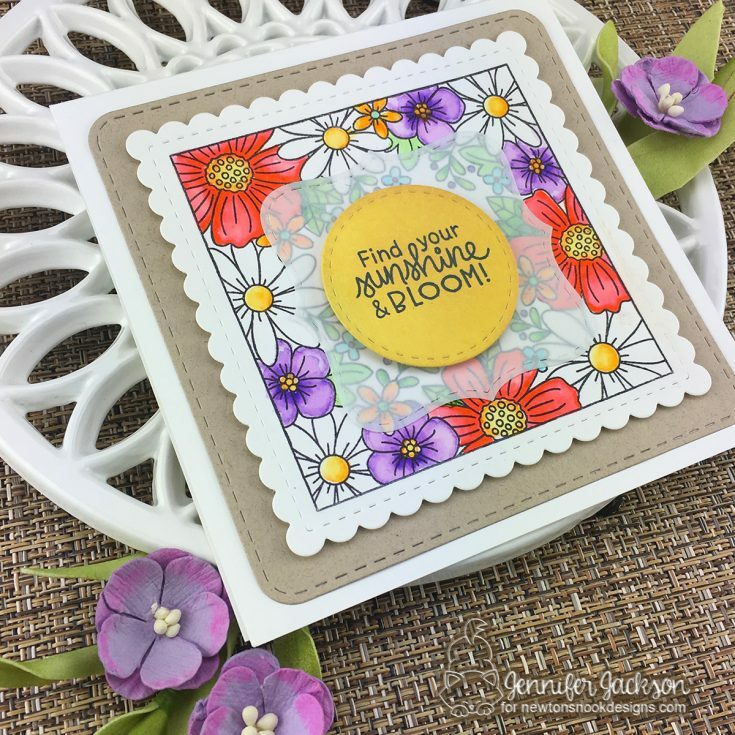 It was hard to choose which sentiment to use since this set has a such a nice variety of sentiments that all fit inside the center of the floral edge! Everything was adhered together using a Kokuyo Tape Runner and some 3M Foam Adhesive to add dimension to the layers. I created a 5″ square white card base using Neenah Solar White Card Stock. I had so much fun making these cards and I hope you enjoyed them! I do also want to mention that the images and the scalloped edge frame do fit on a standard A2 sized card too if you prefer to make your cards that size. I hope you have been inspired to make some lovely square cards of your own! Thanks so much for stopping by and thanks to Jen for being our guest! Oh wow–what great stamps & love your cards! Awesome cards, Love both creations! I love all things Newton, the adorable kitty! Your cards are super cute! I don’t make square cards very often so thank you for reminding me and inspiring me to create some. Simply darling cards! I need to get square! I don’t make many square cards, but these are enough for me to want out of my comfort zone! Two wonderful cards! Love the fun square design and the gorgeous images. Thanks for sharing. I never think of using a square die. Love the cards! great cards! I like the square format! Beautiful colors of the kitties on that pretty card, I am always a big fan of square card! Fun new stamps, the cats are my favorite. I already follow by email. Gorgeous coloring! I love these kitties! I love your square cards! My favorite is the flowers. So cute! Love the kitty cat frame. Just love Newton’s Nook products as well as Jen and Newton! These cards are just ameowzing! I love the cat’s meow card. It is sooo cute! Love these samples! Awesome cards! Newton’s Nook is awesome! LOVE your cards and Newtons Nook!! I really like my layering squares, and your examples are really cute! Adorable cat card! Love that colour combination for the base and love the flower card too. Adorable cards!! I love that they are square. The coloring is awesome!! Fun cards! Like the shape and the flowers are favorite! Adorable square cards. I love all of the cute images! I am a huge fan of Newtons Nook and those adorable kitties! Adorable cards!!!!! I am really loving the square cards! Thanks for sharing. Both these cards are so cheerful and cute! These great stamps reduce a lot of masking when making These designs out of single Image stamps. Great idea. Your cards are so dang cute. Love the floral one! Thanks for sharing with us these sweet cards. Wow, those are so pretty. Fabulous. The cards are so cute, I especially love the one with the cats. Square cards do look cute! These are both so adorable!! I LOVE the sweet kitties and the fabulous linked background!